The same parts are used for Mercer and SPI test indicators made in Switzerland. These are single revolution indicators. The hand is set at 5 o'clock and should make about 1-1/4 revolutions. The crystal needs to be inserted with a crystal press. If you do not have a press, it will be easier to buy the bezel with crystal assembled. 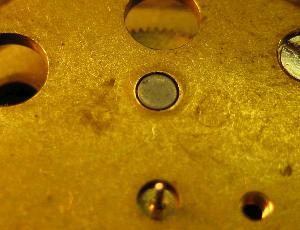 Warning: unless you know what you are doing, you will lose hair spring tension when you attempt to replace the bezel. All parts are available for the models listed below. 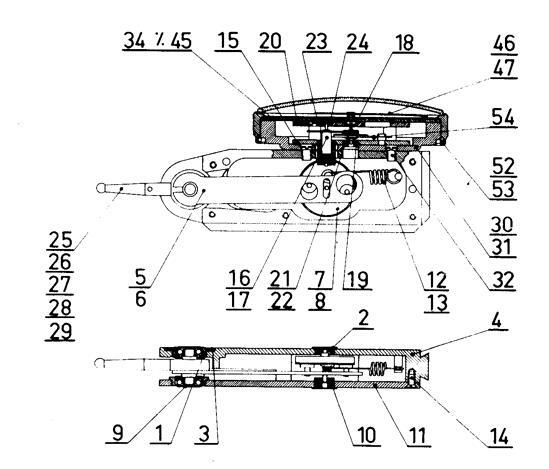 The parts drawing is generic and the actual parts may vary in appearance. This page is for reference only. 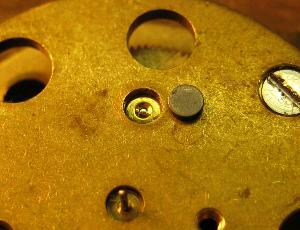 Inch–reading models have been discontinued and parts are no longer available from us. Forgetting the spacer will lead to trouble! Without spacer 041110, the 240 series Compac indicator will not work. The spacer is easy to lose since it falls out every chance it gets. Don't be tempted to glue it in place but a small piece of tape could be put over it to good effect. If there is a secret ingredient to repairing this series of indicators, this is it. The photo on the right shows the spacer properly installed.